The Unconditional Love of Greyfriars Bobby / Scarborough Renaissance Festival on Tues.
that I’ve been dreaming of? Where is she, who I close my eyes to see? From the time of our birth. Some of us find Love. It does not involve just people. This little animal friend died in 1872 and you can still find fresh flowers on his grave every day. His life and his uncommon devotion and love is remembered today with such things as his own magazine, websites, bronze memorials, a Disney movie and numerous items imprinted and engraved with his likeness. Now I had to ask myself, what could a small dog do to engender such love from so many people for so long after his life ended? Then I read the story that became one of the most touching of my life. 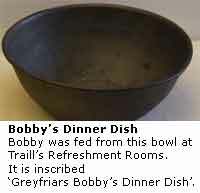 Today, I long to travel to the grave of little “Greyfriars Bobby” to bring flowers of remembrance. As the story goes, Greyfriars Bobby by Ben Johnson, in 1850 a gardener called John Gray, together with his wife Jess and son John, arrived in Edinburgh. Unable to find work as a gardener he avoided the workhouse by joining the Edinburgh Police Force as a night watchman. To keep him company through the long winter nights John took on a partner, a diminutive Skye Terrier, his ‘watchdog’ called Bobby. Together John and Bobby became a familiar sight trudging through the old cobbled streets of Edinburgh. Through thick and thin, winter and summer, they were faithful friends. The Love that blossomed is unbelievable! The years on the streets appear to have taken their toll on John, as he was treated by the Police Surgeon for tuberculosis. John eventually died of the disease on the 15th February 1858 and was buried in old Greyfriars Churchyard. His grave leveled by the hand of time, and unmarked by any stone, became scarcely discernible; but, although no human interest seemed to attach to it, the sacred spot was not wholly disregarded or forgotten. The kind folk of Edinburgh took good care of Bobby, but still he remained loyal to his master. For fourteen years the dead man’s faithful dog kept constant watch and guard over the grave until his own death in 1872. Bobby touched the hearts of the local residents when he refused to leave his master’s grave, even in the worst weather conditions. The gardener and keeper of Greyfriars tried on many occasions to evict Bobby from the Kirkyard. In the end he gave up and provided a shelter for Bobby by placing sacking beneath two tablestones at the side of John Gray’s grave. Bobby’s fame spread throughout Edinburgh. It is reported that almost on a daily basis the crowds would gather at the entrance of the Kirkyard waiting for the one o’clock gun that would signal the appearance of Bobby leaving the grave for his midday meal. Bobby would follow William Dow, a local joiner and cabinet maker to the same Coffee House that he had frequented with his now dead master, where he was given a meal. In 1867 a new bye-law was passed that required all dogs to be licensed in the city or they would be destroyed. Sir William Chambers (The Lord Provost of Edinburgh) decided to pay Bobby’s license and presented him with a collar with a brass inscription “Greyfriars Bobby from the Lord Provost 1867 licensed”. This can be seen at the Museum of Edinburgh. Baroness Angelia Georgina Burdett-Coutts, President of the Ladies Committee of the RSPCA, was so deeply moved by his story that she asked the City Council for permission to erect a granite fountain with a statue of Bobby. The American Lovers of Bobby erected a Red Granite stone to mark John Gray’s grave, the inscription reads “John Gray died 1858 – Auld Jock – Master of Grayfriars Bobby – Even in his ashes most beloved”. The statue of little Bobby has become one of most lasting icons of Edinburgh and his likeness is as well known as all the famous dignitaries whose monuments pepper the streets of Scotland’s capital. Bobby’s headstone is a Red Granite stone erected by The Dog Aid Society of Scotland. The inscription reads, “Greyfriars Bobby – died 14th January 1872 – aged 16 years – Let his loyalty and devotion be a lesson to us all – Unveiled by His Royal Highness The Duke of Gloucester CCVO – on the 13th May 1981”. “Greyfriars Bobby” is undoubtedly the greatest love story of all time, proving once and for all that true love can last for all eternity – beyond this life and into the next. William Brody sculptured Bobby’s statue from life, and it was unveiled in November 1873, opposite Greyfriars Kirkyard. And it is with that, that Scotland’s Capital city will always remember its most famous and faithful dog. And other creatures of God. Is always alive in your heart. Travis poses with one of our counselors. Come and join us for an interactive visit to King Henry VIII’s England! Student Day at Scarborough Renaissance Festival is exclusively for students and is this Tuesday, April 28, 2015 from 9:00 a.m. – 3:00 p.m.
We will meet at the school on TUESDAY morning at 8:00 a.m. to caravan to Waxahachie to enjoy the day at the Scarborough Renaissance Festival. Please Do not be late. We will spend the entire day having fun. PICKUP will be at school at APPROXIMATELY 4:00 p.m. to 5:00 p.m. We may CALL you on our way back and let you know more precisely when to pick up your child(ren), but we MUST have a current telephone number that you will answer on Tuesday afternoon or Dr. A will act very sick. Student ENTRY is $8.00. Adults: $15.00 Lunch is available at the Festival. Festival Facts: Began in 1981. The Festival runs 8 consecutive weekends and Memorial Day Monday each spring. Scarborough Renaissance Festival is a Renaissance-themed festival based on the year 1533, during the reign of England’s King Henry VIII. Scarborough Festival is a 35 acre ‘village’ (larger than most area shopping malls) within a 167 acre site. The festival employs more than 2,000 performers, artisans, and staff. Entertainment: 21 stages & 200 performances daily. 3 Full Combat Jousts take place each day. 150 volunteer members of the Scarborough Academy of Performing Arts make up the performing company that become the “characters” of Scarborough including our very own King Henry VIII and Queen Anne Boleyn. Daily Falconry demonstrations are conducted. Shoppes & Artisan Demonstrations: 200 permanent shoppes feature unique handmade wares made by artisans from around the country. Artisans demonstrate ancient arts such as Glassblowing, Blacksmithing, Candlemaking, Printing on a Guttenberg Press, leather crafting, broom making, Armor making, Coin minting, & much more. Hearty Food: More than 20 tons of the Festival’s famous Giant Turkey Legs are devoured annually. Hand made pastas, seafood, stir fry, steak-on-a-stick, Scott’s eggs, Italian Ice, etouffee, empanadas, fajitas, meatball sandwiches, baklava, quiche, pastries, and more than 60 other hearty foods make up the culinary adventure at Scarborough Renaissance Festival. Five Food Court Areas (kitchens) are located throughout the festival. Students are allowed to dress in costumes. PARENTS / FRIENDS, etc. are always invited to participate. April 28 Scarborough Renaissance Festival-Drama Competition is “Twelfth Night”. We are very proud of our Anderson Scholars participating in the Shakespeare competition on Tuesday: Cole Fisher, Mary Alice Oliver (First Place Winner in the Junior High School Prose and Poetry Competition last year), Natalie Raulerson (First Place Winner in the High School Prose and Poetry Competition last year) and Diana Rodgers. May 4 & 5 (Mon. & Tues.) Anderson School Theatrical Production “Twelfth Night” At Stage West Theater. Please join us. Call us at 817-448-8484 for information. The dress rehearsal performance is on Monday at 7:30 p.m. and the presentation on Tuesday at 7:30 p.m. Tickets will be available at the door. At night, when he was let out from the lodging house that he had now been adopted in, he made straight for Greyfriars – scrambled under the gates and found the grave of his master. He was discovered the next morning and evicted from the grounds, but almost as soon as he was out, he found another way back in and resumed his place with determination. This ritual was performed many times before the church elders finally gave up and permitted Bobby to maintain his vigil. Love, my friends, never dies.